Ideal for a single guest unexpectedly delayed in town by a late or missed train. In years gone by, the Box Room was where you put the trunks and hat boxes. 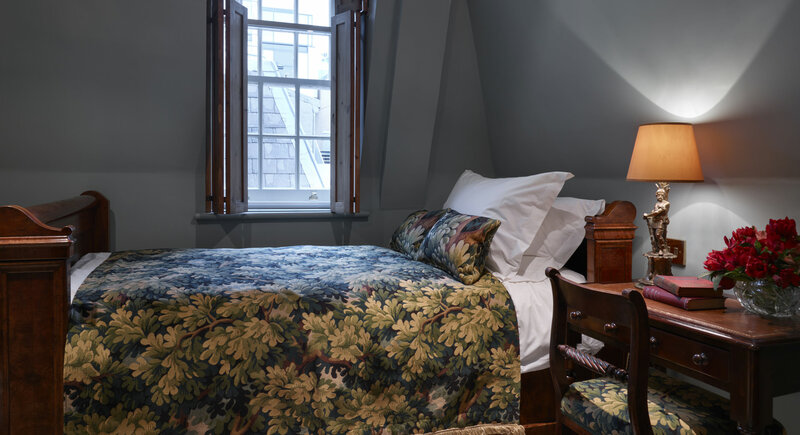 At Batty Langley's, it's where we put adventurous guests who appreciate its quirky charm - a tiny space fitted out like an old-fashioned ship's cabin. The bed is a super-sumptuous French Regence showpiece. The shower and loo are tucked away in elegant, mahogany-panelled alcoves, while the vanity unit looks just like an 18th century china cupboard. There's a delightful view from the south-facing window, and even a compact desk with every conceivable tech connection to the world outside. With air-conditioning, complimentary Wi-Fi, flat screen television and REN toiletries.